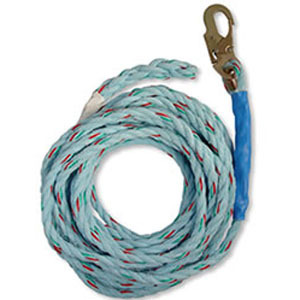 50' Vertical Lifeline is constructed with 5/8", 3-strand co-polymer polyolefin rope. Features a double-locking snap hook and steel thimble at the anchorage end, and a spliced tail at the trailing end. •5/8" CPP rope has a tensile strength of 10,000 lbs.